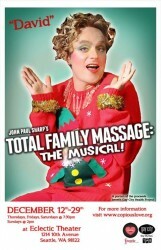 Total Family Massage: The Musical! For Gay-themed shows, I usually send a 23-year old reviewer who moonlights as a drag-queen, but he was unavailable, so I covered The Total Family Massage. Clearly, I didn’t fit into the demographic for which this show was written. An original script, with music and libretto by John Paul Sharp, who also played the lead, the show had a lot of merit, but couldn’t decide what it really was: was it a Cabaret, a Night-Club act, a serious drama, a Drag Act, a bar with some entertainment thrown in or a Musical. Much like a First Novel, the Musical is unashamedly “confessional”. All three acts take place in the living room of a one room apartment inhabited by a gay couple and their two cats. The cats, who are raunchy, introduce the play and comment on the action and dialogue, and act like cheerleaders, leading audience participation. Enter, the newly married couple, David and Marquis, straight from the altar along with David’s divorced parents, the dead sister’s adolescent gay nephew and the best friend from Wichita, Kansas, and the wedding reception from hell begins. There is lots of bickering, hostility, campy behavior, awkward family revelations, as they all drink heavily. Interspersed with musical numbers and talking ghosts of relatives, the play continued for two more unnecessary acts. All the songs were excellent, the music was superb, the lyrics were catchy, witty and the actor/singers all delivered the goods. Although the script had some moments of emotional reality, especially from Jason Dooley as Jeremy the 17year old nephew, Hisam Goueli, as Marquis, the stable newly married partner, and Mary Nelson-Brown as Marie, David’s mother, most of the acting was caricatured and campy. Mr. Sharp seems to have the same problem as Wagner, he writes great music but his librettos are overly long, repetitive and he does not know when to end them. (N.B. the show lasted three hours) Also, it suffered from the same flaw as most first novels, the writer makes himself the hero. Some real insight into the family and our hero’s dysfunction, as well as the dysfunctional relationship of the couple, was given short shrift: Musician/slacker David, played by John Paul Sharp, is a substance abuser of alcohol/ weed and Marquis is the enabler. Although Marquis finds David’s narcissism endearing, I did not. However, the audience loved it and there was a standing ovation. The bar was open before the show and during the two intermissions, so quite a few members of the audience seemed to be drunk. They were also one of the rudest audiences I’ve ever seen. One woman walked out shortly after the beginning of the second act, right in front of two actors singing a duet, another woman took pictures several times, making it difficult for those of us who sat behind her to concentrate, as the light from the I-phone was distracting. Having said that, I think John Paul Sharp, having written about his family and himself, is now ready to move on and write a libretto which matches the high standard set by his music and lyrics. Hopefully, next time, he’ll get the accents right. People from Wichita, Kansas do not speak Southern, but all the folks, in the play, from Kansas spoke with too Southern an accent. If you like raunchy, long, campy, boozy entertainment, this is the show for you. However, it is not recommended for children.